Who’s your DJ!? A question most commonly asked once people find out your getting married. One of the most critical aspects of a wedding (besides the cake) is sound. Yes of course you hope that the cake tastes right, but you also want your guests and great aunt Ethel to be able to hear your vows and toasts. Remember those wedding receptions where the DJ said “I don’t take requests because I know what to play,” and you could never make out the song? No one wants to go through that ever. Whether you choose to have your music played solely through a sound system or integrated with live musicians, our DJ/Entertainer will work behind the scenes alongside venue coordinators to make sure that your ceremony flows seamlessly as planned. The reception can be “make or break” when it comes to the entertainment. Pretty much any individual can press play on an audio device, yet it takes a personal talent when hosting such a special event. At Prestige-Sound, our DJ/Entertainers have been working within the industry for many years, bringing not only their expertise in music, but the ability to “read the crowd” in order to maintain the level of fun on the dance floor. Sticking to only one genre will never work. A professional DJ will be versed in all categories of music and age groups to insure the party will never stop! Our DJ/Entertainers are held to a degree of professionalism and service while ensuring that every aspect of your reception is met. In striving to go above and beyond, we will work with you to create a one of a kind reception that is tailored to your desire, making it an original. Hosting a party for your company or school function is always a hit, especially when you have requested the professionalism and talent of our DJ/Entertainers. 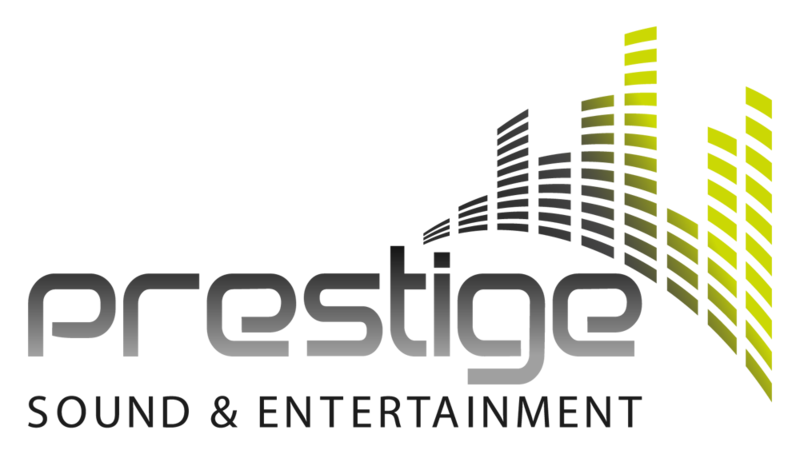 Prestige Sound & Entertainment provides industry grade equipment in order to make your event the highlight of the year. Throughout the planning process we are readily available to answer any questions you may have to create the perfect event. We are accessible via phone or email to attend your every need. Our meet & greets are FREE, with no obligation or pressure to commit. We will meet with you to explain how Prestige Sound & Entertainment operates as well as show you how we will make your wedding/event stand out above the rest. Simply, this meet helps you get to know us on a personal level. Contracting and securing your date requires a one time non-refundable booking fee of $100.00, which will be subtracted from the total cost of the event. We require the balance to be paid the week of the event. We have a professional and dedicated team of DJ/Entertainers of who will be assigned to you. Yes, you will be able to meet with them and have 24-hour access to their email prior to your event. If you require any last minute changes to songs or times, just let us know so we can arrange to make the changes. A week before your event date, we will contact you to make sure that everything is in order. Our DJ/Entertainers will arrive 1-2 hours early to the event, making sure the set-up is perfect. Once you have decided to hire us, you will be provided with a Reception Planner or Event Planner, which serves as a guide from start to finish of the event. This guide will ensure what you wish your event to be. It will also help us get to know you better personally. What type of payments to you accept? And when do they need to be paid? Great question. We accept cash, check, money order and PayPal. Initially, you can pay at any time, yet we ask to have the final payment the week of the event. We are very easy to work with and will help you out in any way we can. Ultimately, our clients will have access not only to their DJ/Entertainer, but also with Prestige Sound & Entertainment Operations, which will monitor and assist everyone/everything throughout the process. We like to call this our HAKUNA MATATA (worry-free) philosophy. Let us take the worry out of your planning!